Those of you who follow American literary culture carefully may recently have heard that a documentary about Joan Didion’s life and writings is slated to be released in Fall 2015. The documentary, We Tell Ourselves Stories in Order to Live, is being produced by Susanne Rostock and noted actor/director Griffin Dunne (Dunne is the nephew of John Gregory Dunne, who was both Didion’s husband and screen writing partner for more than 30 years, and about whose death she wrote so eloquently in The Year of Magical Thinking). As part of the Kickstarter campaign to raise enough money to complete the film, Didion supporters, including yours truly, received a hand-written list of Didion’s favorite books as a thank you. Didion’s essays and political writings are heavily influenced by many of her contemporaries of the 60s and 70s, particularly other New Journalists such as Norman Mailer, Truman Capote and Tom Wolfe. When it came to fiction, though, she largely draws on authors writing one or two generations before her, including Ernest Hemingway, John O’Hara, James Baldwin and Ford Madox Ford. Didion is particularly noted for first mastering, then outshining, Hemingway when it comes to his “iceberg” theory of writing, which posits that what is deliberately left off the page resonates more deeply than what does appear (i.e., how the author’s use of specific words, syntax, repetition, rhythm and cadence enables readers to implicitly understand what lies beneath the surface of the text itself, or what we today call “the emotional subtext”). Just as she was influenced by these writers and others, so too has Didion influenced writers of my generation. 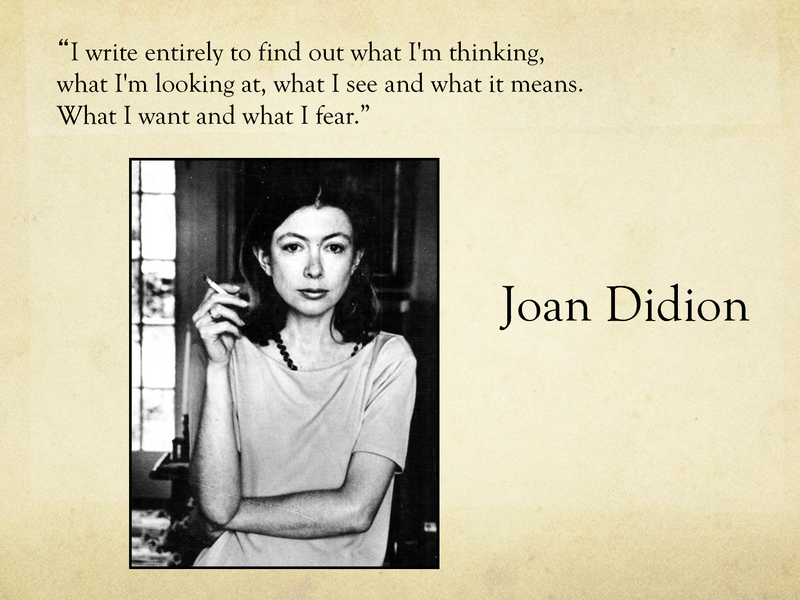 Indeed, I read my first Didion novel, The Book of Common Prayer, the summer I graduated from Mount Holyoke–and then went on to devour everything she has ever published. If any of my own fiction or essays resonate at all with readers, it is thanks to her. If you haven’t yet had occasion to read her work or only know her more recent books (she is well into her eighties now and rather frail), the best place to start would be with her brilliant series of essays, Slouching Into Bethelehem, or the novel Democracy, both of which are readily available from your local library or independent bookstore. For my day job I work as a Director of Public Relations for one of the nation’s largest corporate law firms, a highly demanding position which generally requires me to work 50-60 hours a week. In that capacity, I got to know Richard Smolev, a partner, who after being diagnosed with ALS (also known as Lou Gehrig’s disease) about five years ago, immediately retired from the firm. Rather than feeling sorry for himself, he decided to do something he had always aspired to professionally–write novels. Two of them, Offerings and In Praise of Angels were both published by Chicago’s Academy Press last year. While I only met Richard in person once when my team helped organize a firm book signing for him in honor of Offerings’ publication, likely because he knew that I too was a writer, he and I became “email” friends. On New Year’s Day, facing again the difficult task of resuming work on chapter five of my novel after not having had a moment to think about it, let alone write something, for more than two weeks, I procrastinated by writing a list of people and things that I turn to when life felt both fragile and challenging at the same time and realized he too was on the list. I didn’t send it to Richard, though, because with so little time left, why should he have to waste any of it by reading a silly list of my inner thoughts? And he had never seen any of my writing before, my real writing–neither a story, nor an essay, I didn’t want this one piece to be his first introduction to my work. I didn’t want him to think badly of me; I didn’t want to let him down one writer to another. Still after deliberating about it for several days, I finally did send it to him, my potentially wounded ego notwithstanding, because I wanted him to know how much he had come to mean to me even though we didn’t know each other well. I sent it to him ten days ago. He responded within hours, saying he enjoyed seeing it, “especially the part about ‘fracking.’ My wife has worked very hard campaigning against fracking in the area where we live,” he said. I did not hear from him again. Sandi Sonnenfeld is a fiction writer and essayist and the Managing Editor of The Lyon Review. Visit www.sandisonnenfeld.com for more. 1B. At 82 years of age, Canadian short story writer Alice Munro was long overdue for this honor. 2B. While Poe is probably best known these days for his Gothic tales like the Tell-Tale Heart or The Fall of the House of Usher, he is widely credited for invented the detective story or mystery. Indeed the Mystery Writers of America‘s top prize, the Edgar, is named in his honor. And Sir Arthur Conan Doyle, the creator of Sherlock Holmes, was a huge admirer. Poe did also write science fiction but was not the first to do so. 3E. Annie Dillard attended Hollins University, a women’s college in Roanoke, Virginia. An essayist, poet and novelist, Dillard is particularly known for her gorgeous prose and contemplations on nature, winning the Pulitzer Prize for Nonfiction for Pilgrim at Tinker Creek at just 28 years of age. Plath and Steinem both attended Smith, Le Guin attended Radcliffe and Wasserstein, of course, Mount Holyoke. 4D. Novels Persuasion and Northanger Abbey were published by Austen’s brother after her passing. She had worked on and off on both novels for many years. 5C. Agatha Christie remains the world’s best-selling author. Her 82 books have been translated into 44 languages with an estimated four billion copies of her various mysteries sold. 6D. Jordan Baker was Daisy’s best friend and love interest of Nick Carraway. African-American dancer and night club star Josephine Baker was the toast of Paris during the 20s and 30s–the same period in which Fitzgerald wrote and coined the term, The Jazz Age. 8D. James Baldwin began publishing in the mid-40s, about twenty years after the Harlem Renaissance. His best known work today remains Go Tell it On the Mountain. 9B. British author Fowles said the masterful psychological novel in Greece. Perhaps best known for his novel, The French Lieutenant’s Woman thanks to the 1982 movie version starring Meryl Streep and Jeremy Irons, Fowles once said that all of his novels, he loved The Magus the best because it was the most flawed. 10D. While Margaret Atwood writes everything from science fiction to historical novels to poetry to literary criticism, Lark and Termite is a novel by Jayne Anne Phillips, about two siblings living in West Virginia in the 1950s during the Korean War and for which Phillips was nominated for the 2009 National Book Award. 12D. While the concept of the tesseract is real, to date no one has been able to bend time and space in such a way to make hyperspace travel possible. 14. “Absolution” was written by that other brilliant Catholic American short story writer, none other than F. Scott Fitzgerald. Some literary scholars say this story was originally part of one of the earlier drafts of The Great Gatsby. Fitzgerald wrote more than 400 short stories, mostly for the Saturday Evening Post, to cover Zelda and his living expenses while he worked on his novels. Notes and commentary by Sandi Sonnenfeld ’85, Managing Editor of The Lyon Review.